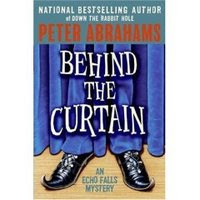 Behind the Curtain: An Echo Falls Mystery by Peter Abrahams. HarperCollins. 2006. I don't remember where I got my copy; probably the library. This review originally ran at the The Edge of the Forest. Ingrid Levin-Hill, the mystery solving middle school student from Down The Rabbit Hole, returns in this sequel. This time around, the intrepid Ingrid finds herself in the middle of a mystery or two when she wonders about her brother's Ty moodiness and her new business associate that may be putting her father's job in jeopardy. Ingrid does what she does best – takes action! – and soon finds herself the victim of a kidnapping attempt. If only she knew who was behind it. Behind the Curtain is a great mystery; there's no ghosts and the mysteries are ones that affect Ingrid, her friends and family – possible illegal steroid sales, shady business deals, a suspicious soccer accident. Ingrid remains a real treat; she's resourceful, gutsy, and hardworking; but she's also been known to sleep late and goof off in class. Sixty years ago, Nancy Drew had the freedom to solve mysteries because Mom was dead and her father indulgent; Ingrid's freedom comes from two working parents. Yes, they love her; yes, the care about her; but there are bills to pay, jobs to keep, houses to sell; and while Ingrid is scheduled (soccer practice, play rehearsals, sleepovers) she also has the freedom to bike around town. Her parent's inability to pick her up on time is a running joke, allowing Ingrid the opportunity to sneak into janitor's offices and overhear suspicious things, all while still being chauffeured by Mom or Dad. This is the second book in the Echo Falls series; and both books have stand alone mysteries. Yet, it's not all open and shut; Ty's odd behavior, the basis for one of Ingrid's investigations, was first mentioned in Down the Rabbit Hole; and Behind the Curtain does leave some questions unanswered, such as what exactly did Gramps do in the war? And why are so many people eager for the family to sell the farm? Is a new strip mall or McMansion development that important? I can't wait for the third book to find out what Ingrid is up to next – and to see if any of these questions get answered. Edited to add: Book Three is Into the Dark (Echo Falls Mystery) . Aren't they great? I still have to read the third one. I thought the 3rd one was a little darker than the first 2, but I still loved it. Have not read any of this series ... something I tend to correct shortly. I love a good mystery and one that does not depend on paranormal stuff to engage the reader. Thanks for sharing. As always a wonderful review.